What’s in your facilitation toolkit? Mine includes markers, sticky notes, index cards, and flip chart paper. But wait, paper??? Yes. And, I’m not alone. Take for example my colleague Eugene Eric Kim who shares his facilitation toolkit which includes links to his favorite Post It notes and markers. David Lavenda wrote this excellent article in Fast Company about the history of the Post-It notes and their potential for becoming a killer innovation technology. It talks about the early history of the Post-It note (as a bookmark for memos) and how they made brilliant pivot to innovation and collaboration tools with the rise of digital tools since its invention in 1980. He references one of the thought leaders of the sticky notes as a collaboration tools, Tim Brown, Author and CEO of the design and innovation company Ideo,who recommends the Post-it Note as a perfect tool for brainstorming. Process Analysis: Let’s you analyze a process or problem to find ways to simplify or understand a problem. Will Digital Post-It Notes Replace Paper? When I facilitate training, I use analog and digital tools and materials. I know some colleagues prefer not to use paper, but go all digital. I don’t always have a lot of participants who are eager to do exercises digitally, but when I do I can work with them to adapt the exercise. There are apps that allow participants to use “virtual sticky notes” to do an exercise but these are not well designed for group collaboration. 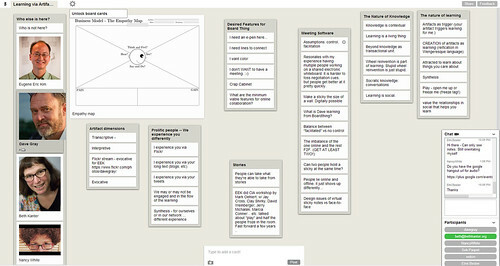 A few months ago, I listened in on a Google Hangout with Eugene Kim and Dave Gray where they discussed the question “Is documentation learning?” We got to use Dave Gray’s “Board Thing” which is a virtual version of sticky note facilitated group collaboration (that’s a mouthful) or as Dave described that his book, Gamestorming , was a paper prototype for software. It was fascinating to experience this tool and hear how Dave is thinking through what can brought online from a face-to-face experience. For example, with board thing, we all have control over organizing and taking notes on the “sticky notes” – and was interesting to see our emergent collaboration. Speaking of documentation, that’s where digital tools can come in handy – for example your mobile phone camera. I document everything, including those sticky notes — partly as a report to jog participants memories as well as for my own learning and review of a workshop. 3M just released an app that helps you capture a brainstorming session that produces a scattered wall of Post-it notes. The Post-it Plus app helps you scan the notes, make some sense of them, and share them with your meeting’s participants. What do you think? 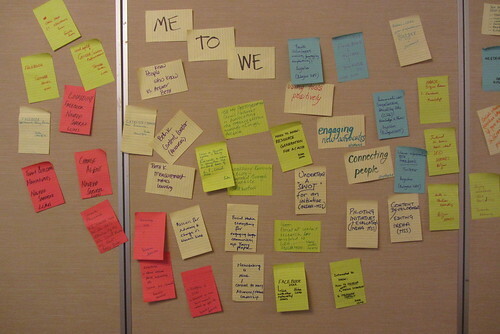 Are sticky notes the killer app for innovation? I can’t imagine my professional work without sticky notes, but the killer app is and always will be PEOPLE! And I love http://www.boardthing.com from Dave Gray. I’ll be using it next week with a bunch of learning folks to talk about how to use visuals in online learning! Oh…I like BoardThing! I need to explore how it compares to StormBoard (formerly Edistorm). Nancy…I know you’ve seen both…but not sure you’ve actively compared them. What is your gut reponse to BoardThing vs. StormBoard? P.S. 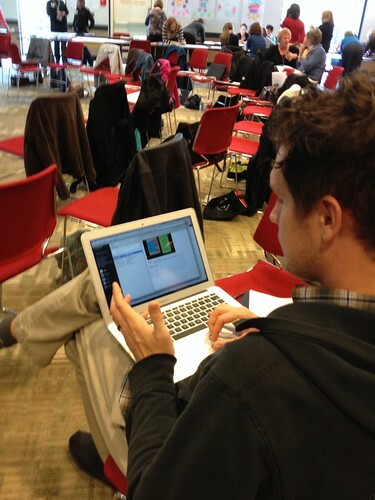 Would you be able to share the results of your conversations next week about visuals in online learning? That’s right up my alley…and I’m always eager to learn and think deeper about my practice in that regard. I haven’t looked at StormBoard in too long! I was playing with https://realtimeboard.com/app/61266423/My-First-Board/ yesterday, but now that you can draw on Boardthing, it is still top of the heap for me. I can do more types of things on one tool. I’m someone who loves taking notes on paper & post its work well for me. I find I retain information better if I’m writing it down – versus typing it. It’s kinda funny because people just assume that because I’m in the Millennial age bracket that I should be a digital only devote.